Nishinoshima Island is erupting again after about a year and a half, and the level of volcanic activity is about the same as the 2014-2015 eruptions that saw the island's surface area expand at a remarkable rate, the Japan Meteorological Agency (JMA)'s Meteorological Research Institute announced on June 19. Based on analysis of gases emanating from the volcano in the Ogasawara Island chain, the institute believes there is a steady supply of magma and the eruption is likely to continue for some time. The JMA observation vessel Keifu Maru took the readings from May 25 to 27, and recorded Strombolian eruptions -- small to medium explosive lava eruptions -- about once every 46 seconds. The JMA also observed Vulcanian eruptions -- short and violent explosions -- about once an hour, scattering ash and other ejecta around the area. The volcano is spewing out about 500 metric tons of sulfur dioxide per day, indicating a high level of activity not seen on Nishinoshima since October 2015. 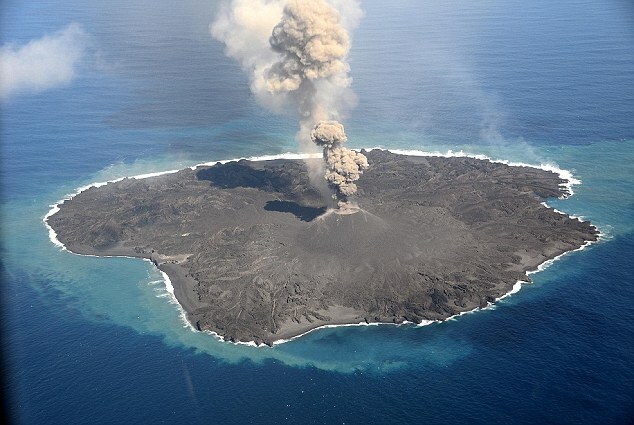 The Nishinoshima volcano began erupting in November 2013, calming down again almost exactly two years later. It began erupting once more in April this year. "It's very rare to be able to observe a volcano re-erupting," commented research institute volcanologist Akimichi Takagi.